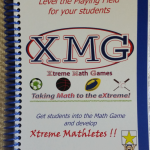 Includes 3 XMG Algebra Dice Bags and an Algebra Supplement with 10 different ways to play the game such as: Multiplying Binomials, Trinomials, Absolute Value, % Increase, Pythagorean Theorem, Linear Equations and more. Contains rules, over 30 variations, management and teaching strategies, actual game situation, and reproducible pre and post assessments. See the Algebra Supplement for more in depth Middle School Concepts. Includes 6 XMG Algebra Dice Bags and an Algebra Supplement with 10 different ways to play the game such as: Multiplying Binomials, Trinomials, Absolute Value, % Increase, Pythagorean Theorem, Linear Equations and more.